Even before LIGO announced the discovery of gravitational waves speculation had abounded about who would win the Nobel Prize for the finding. Gravitational waves are definitely Nobel-worthy so there is no doubt that someone would be recognized. The question as usual is who. "When the Nobel Prize was set up by Alfred Nobel 113 years ago, science was done very differently. It was done mostly by individuals, there was very little international collaboration and it was done very cheaply. "But it has radically changed. A lot of cutting edge science, a lot of work on the most important problems in science is a team effort. It is done by large interdisciplinary teams." If the committee keeps on continuing to follow the rules which they established since the prize's inception, they will increasingly be out of step with important mainstream science. Whether it’s physics (LIGO, Kepler, LHC) or biology (ENCODE, Brain Map), it’s pretty clear now that much of the most important science is done by large groups around the world working together. This trend is likely to only grow bigger. The Nobel committee already ignored the collaborative nature of research when they awarded the 2013 physics prize to Peter Higgs and Francois Englert, both of whom undoubtedly deserved the honor. 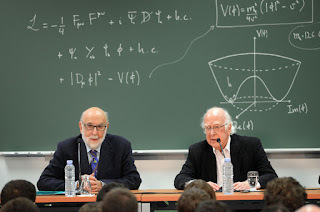 What was left out was the large team of very capable experimentalists working at the LHC; without them Englert and Higgs’s dream would have stayed a dream. There are perfectly reasonable grounds to recognize both the ATLAS and the CMS experimental groups who actually found the Higgs boson, and the time is still very much ripe to take that step. This is also not the first time that discoveries in particle physics have failed to recognize organizations like Fermilab, CERN and Brookhaven National Laboratory which made them possible. This year’s discovery by LIGO is similarly prompting calls to recognize a few select individuals. The names most commonly cited seem to be those of Kip Thorne, Ron Drever and Rai Weiss. All three of them have been shepherding the LIGO project through tough scientific and political challenges right from the beginning and all three of them deserve the honor. And yet hewing to the 3-person rule – a rule that isn’t even enshrined in Alfred Nobel’s will – and ignoring essentially the entire LIGO team of experimental physicists, engineers, statisticians and other personnel who built and serviced the detectors, spent hours looking at the data and then carefully and rigorously analyzed it will be a great disservice to their hard work and dedication. It’s not like the rules of the prize have not been amended before; after all the economics prize did not exist in Nobel’s will and the peace prize has been routinely awarded to organizations and not just individuals. The LHC discovery of the Higgs boson and the LIGO discovery of gravitational waves is a resounding cry for the arbiters of the prize to take an extra short step and do the right thing. The time has come for the Nobel Prize to step into the twenty-first century. We imagine in our minds black holes and galaxies extending over billions of years into the past and into the future outside our mind in a physical space. We create the past and future only in our minds. Past and future does not exist around the body outside the mind only in the present moment. Past and future of bodies is in the mind, they are not around the body. The creation of past and future of bodies and cosmos is in our minds. The creation is from our scientific predispositions. Knower-physicist is the reality now. Past and future of time are unreal compared to real present ‘now’. The cosmos of physics is a utilitarian model of physicists. It is similar to the utilitarianism models created in molecular biology, neuroscience, economics and politics and other social sciences but much more dependable and accurate. This has been discussed for a long time, so wouldn't expect any changes.